The SPACE 58.58 by IMG. Click here to view the schematic and technical information sheet. 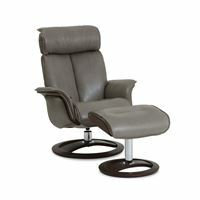 The back rest is reclined or raised by a supportive pneumatic piston. 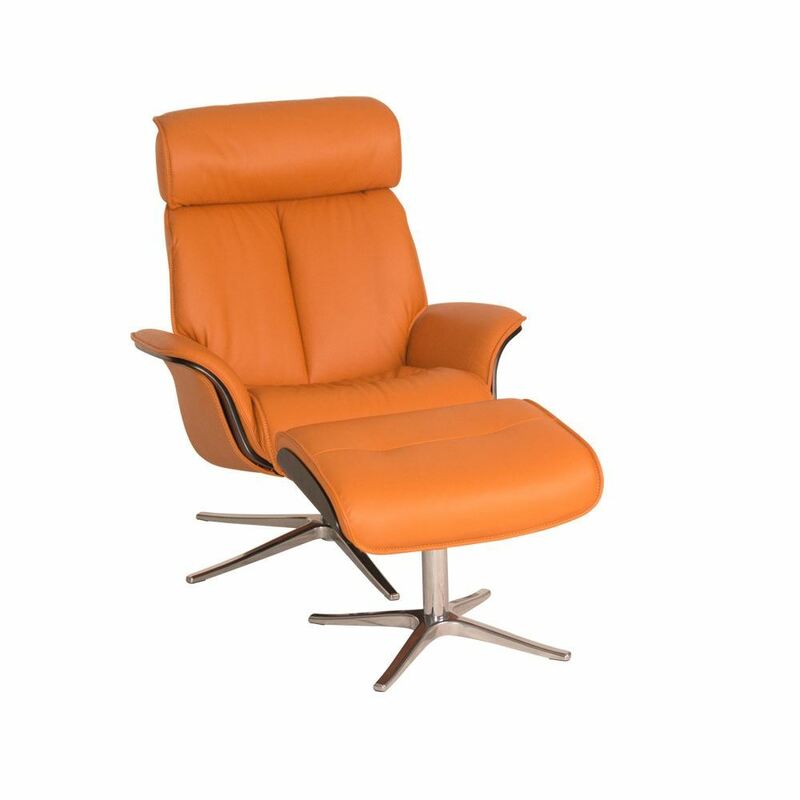 There is a leather tab handle situated between the seat cusion and arm rest, which is activated by gently pulling on the leather tab. 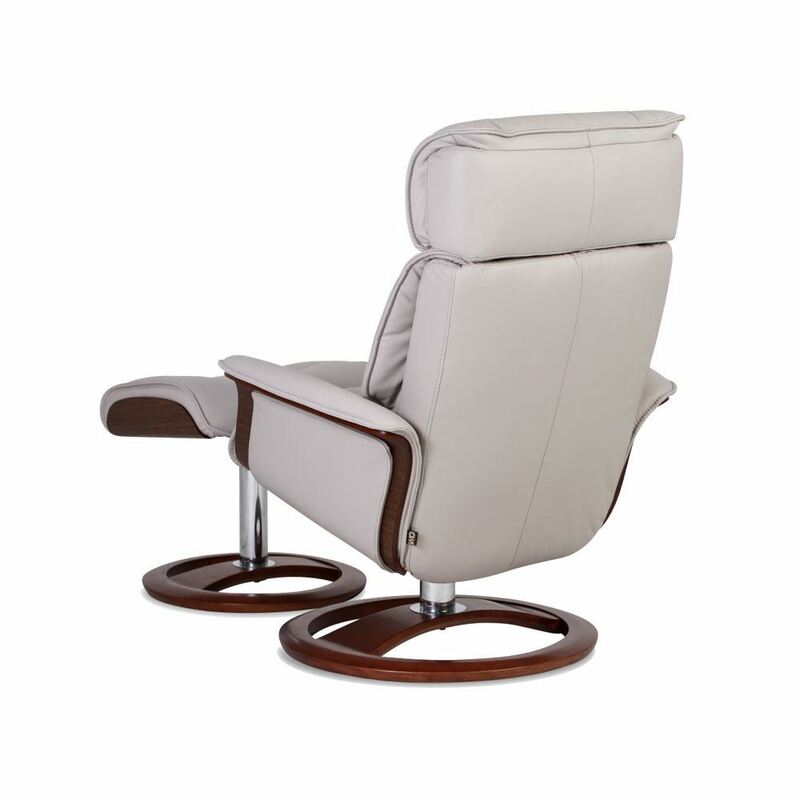 In doing so, the pneumatic piston is activated, allowing the back rest to gently recline back or raise forward. 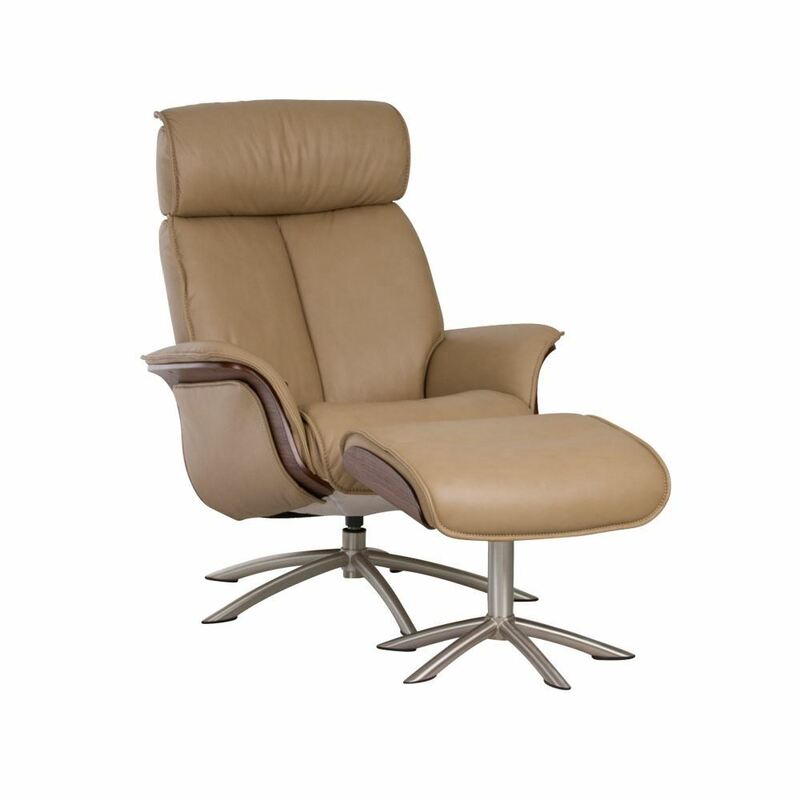 Please click other tabs to view available leathers, fabrics, and other impotant details and features. IMG WOOD GUIDE Most of our products and components are based on laminated wood construction technology. Utilizing a process called UltraSonic wood lamination creates strong frames and allows us to create graceful designs. Environmental and consumer friendly adhesives and materials are used in the production process. We use light colored wood like beech with an attractive grain to make veneer and laminated parts. They are highly suitable for staining in various colors. What are Furniture Protection Plans? Nothing gives you more confidence and satisfaction than knowing that your furniture purchases will remain beautiful and valuable for as long as possible. With Guardsman® Furniture Protection Plans, you will have peace of mind knowing that your new leather furniture is protected from accidental stains and damage. * This plan provides you with a furniture repair expert when you need one. Guardsman has a network of thousands of professionals across the United States and Canada who can: CLEAN ACCIDENTAL STAINS*	REPAIR ACCIDENTAL DAMAGE* - Food and beverage stains - Household stains - Ink stains - Lipstick, nail polish, cosmetics - Human and pet bodily fluids - Punctures, rips, cuts, tears and burns in most leathers and fabrics - Burns, heat marks, scratches, and gouges in wood - Springs, frames, and certain mechanisms *Please consult your plan or for specific information about coverage (including whether your plan offers replacement coverage) and exclusions. What are Furniture Protection Plans? Nothing gives you more confidence and satisfaction than knowing that your furniture purchases will remain beautiful and valuable for as long as possible. With Guardsman® Furniture Protection Plans, you will have peace of mind knowing that your new fabric furniture is protected from accidental stains and damage. * This plan provides you with a furniture repair expert when you need one. Guardsman has a network of thousands of professionals across the United States and Canada who can: CLEAN ACCIDENTAL STAINS*	REPAIR ACCIDENTAL DAMAGE* - Food and beverage stains - Household stains - Ink stains - Lipstick, nail polish, cosmetics - Human and pet bodily fluids - Punctures, rips, cuts, tears and burns in most leathers and fabrics - Burns, heat marks, scratches, and gouges in wood - Springs, frames, and certain mechanisms *Please consult your plan or for specific information about coverage (including whether your plan offers replacement coverage) and exclusions. CLEAN & RENEW WIPES FOR LEATHER, 20 COUNT - PRODUCT INFO Cleans free of streaks and dust-attracting residue common with all-in-one cleaners. Maintains leather's intended sheen free from artificial gloss. Leather cleaning at its best -pH balanced and alkaline-free to preserve leather's soft, supple feel. Ideal for use on finished, aniline, and semi-aniline leather, as well as vinyl. Not intended for use on suede and nubuck. Made exclusively for Guardsman in Italy by a world leader in leather finishing technology. PROTECT & PRESERVE WIPES FOR LEATHER, 20 COUNT. PRODUCT INFO - Forms an invisible barrier that safeguards against premature aging and irreversible damage from penetrating stains Improves stain and soil resistance for easier cleaning Helps protect leather's original feel and color to keep it looking its best and feeling soft and supple. Ideal for use on finished, aniline, and semi-aniline leather, as well as vinyl. Made exclusively for Guardsman in Italy by a world leader in leather finishing technology. Not intended for use on suede, nubuck, or buffed leathers. To protect those leathers, use Guardsman Fabric Defense. FABRIC DEFENSE STAIN PROTECTION, 11.0 OZ CAN. PRODUCT INFO: Long-lasting stain protection helps furniture look newer, longer. Won't change fabrics look or feel. Odorless when dry. Formulated to meet the demands of furniture professionals. Made in the U.S.A. Not intended for use on finished and aniline leathers; to protect those leathers use Guardsman® Leather Protect & Preserve to protect finished leather and vinyl furniture.